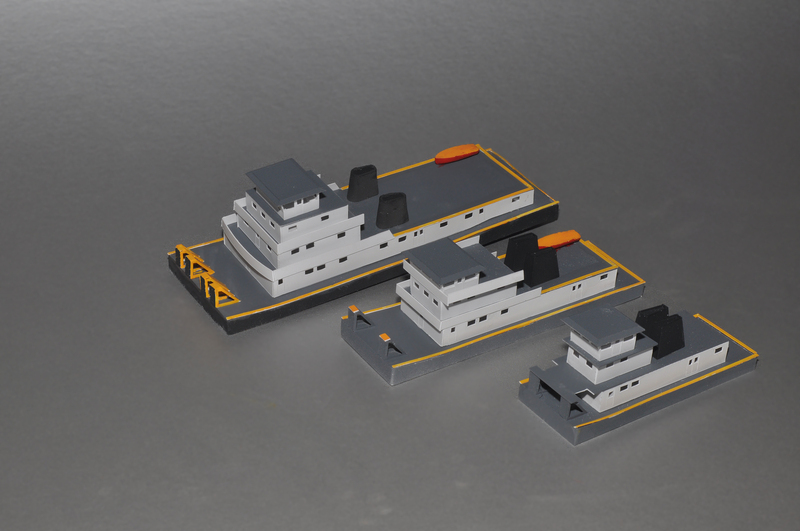 Three Z Scale Mississippi river towboats will be ready for production in late February. Here they are shown without railings, stairways and small deck details, all custom designed for the boats but back at my Ohio home. The largest is 145′ long by 48′ wide and is modeled on the Jeffboats built in Jeffersonville, IN. Jeffboat, now owned by American Commercial Lines (ACL), is the second largest builder of barges and towboats. The middle boat is 110′ long and 34′ wide and represents boats built by a number of manufacturers. The smallest boat is 85′ long and 30′ wide–the median size of the towboats on the MIssissippi, Ohio, Missouri and other rivers. I still haven’t decided whether to cast the hulls or, because they are so simple to build, just offer them as built-up styrene. Superstructures are built-up styrene. Prices for kits for single towboats will be in the $50-100 range.